This ribbed steel design trash receptacle with ergonomic side opening door is sure to be a benefit for just about any waste control program. Models with the rain bonnet top offer a great solution for keeping the included liner from filling with weather elements. 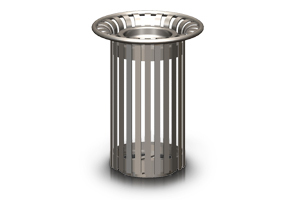 Provide smokers with a proper way to dispose of smoking waste with the matching stand alone snuffer or select the model with rain bonnet ashtray top. 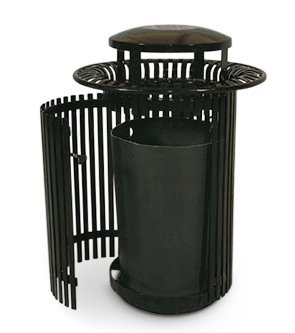 The 32 gallon trash receptacle and snuffer are manufactured from A36 grade steel with corrosion resistant powder-coat finish that is available in the colors as shown; each individual slat has rounded edges on 3/16" thick rolled steel.